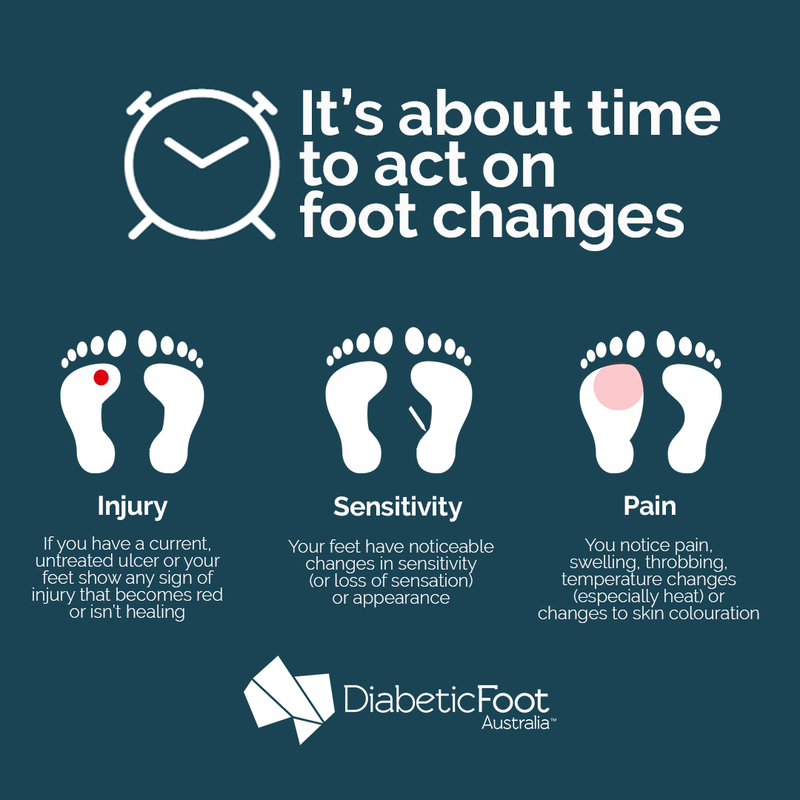 Diabetic Foot Australia (DFA) was established in 2015 with the goal of ending avoidable amputations within a generation in Australia. 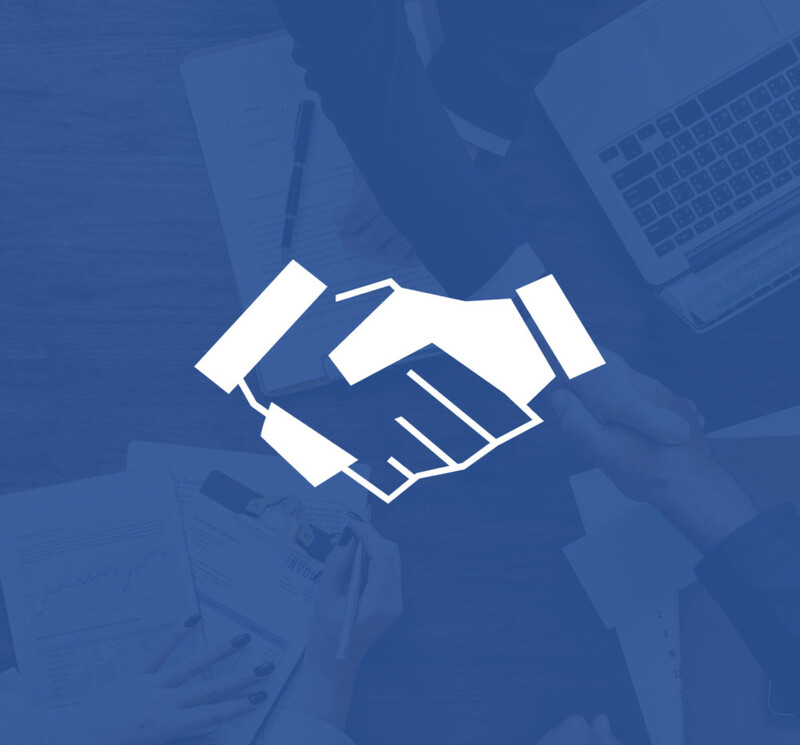 As a key initiative of the Wound Management Innovation CRC, we engaged the expertise of multiple partner organisations across Australia to create a national diabetes-related foot disease (DFD) body for Australia. On the 1st July 2018, Diabetic Foot Australia joined the Australian Diabetes Society's (ADS) stable of national diabetes clinical and research programs. Empowering patients, their carers and families with knowledge and pathways to healing. Supporting health professionals to improve clinical and quality of life outcomes for people with diabetic foot disease. Providing leading diabetic foot researchers with infrastructure and support to accelerate high quality clinical research in Australia. Linking Australian industry with multidisciplinary key opinion leaders and maintaining visibility of the growing national problem of diabetic foot disease. We bring together some of the globe’s most renowned researchers and clinicians in the fields of diabetes and foot disease to cover the latest research, from bench-top to bedside. From our conference to our 'What's New in DFU' events, we focus on the latest research, evidence-based practice and new technologies. Published in the Journal of Foot and Ankle Research, the 2018 Australian Guidelines on footwear for people with diabetes contains 10 key recommendations to guide health professionals in selecting the most appropriate footwear to meet the specific foot risk needs of an individual with diabetes. New research on diabetic foot disease is published on an almost daily basis. 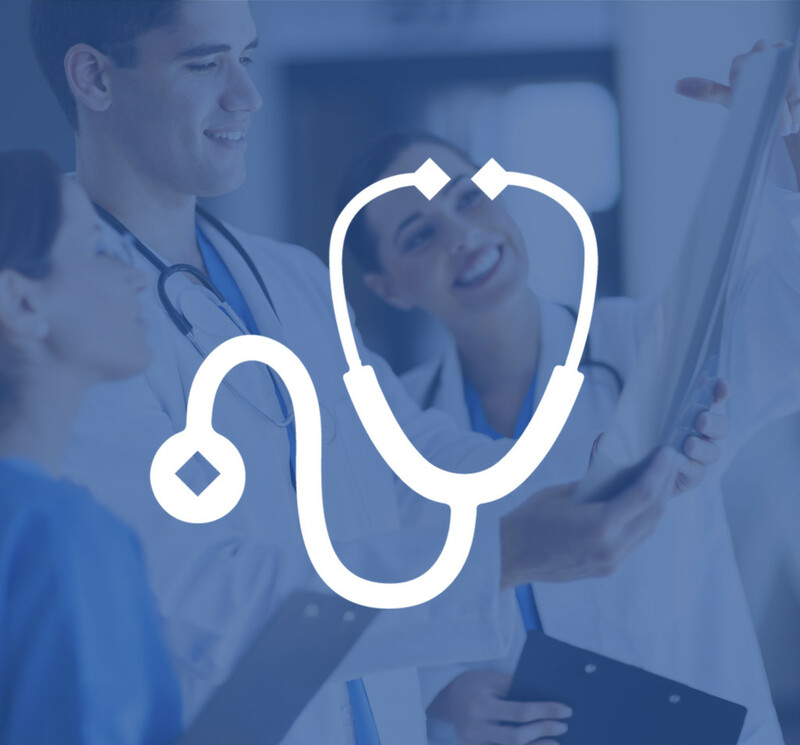 Each month we release latest news and research to provide practical clinical summaries of the latest evidence on how to assess particular conditions according to the world’s leading authorities. 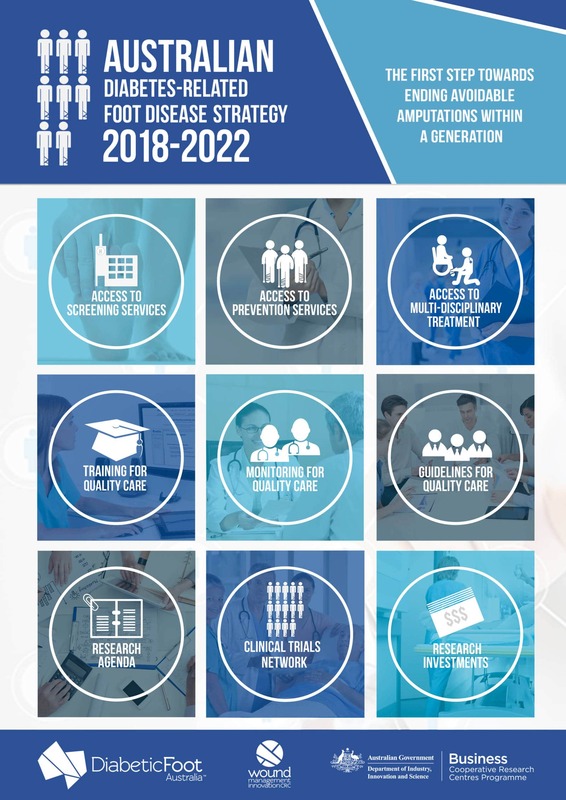 The “Australian diabetes-related foot disease strategy 2018-2022” is the first step towards ending avoidable generations within a generation. 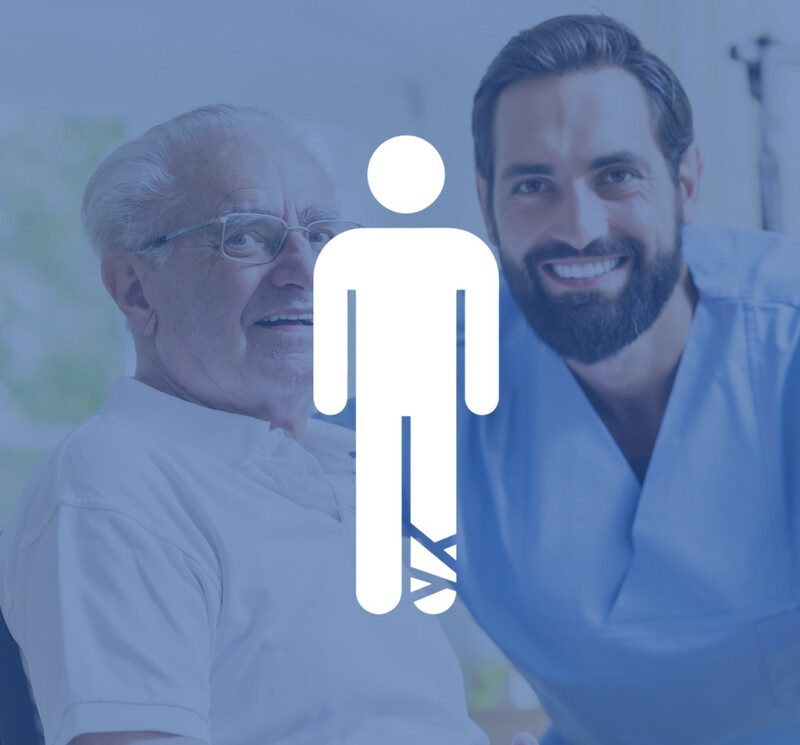 This strategy was written by Diabetic Foot Australia with input from various national and state peak bodies, interdisciplinary foot disease services and individual experts from the Australian DFD community. 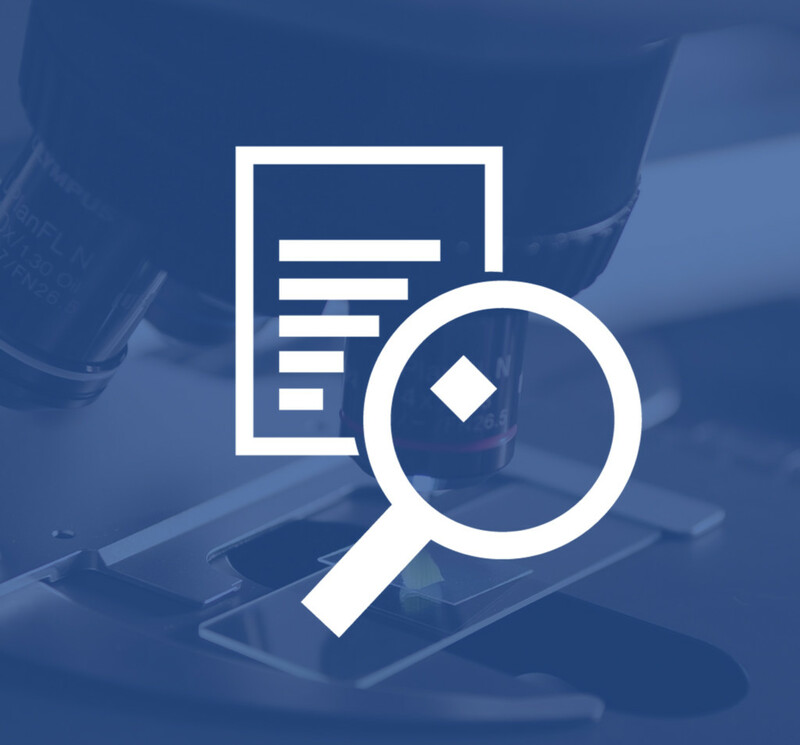 Diabetic Foot Australia has established the Australian Research Repository to showcase published Australian research on diabetic foot disease. Each entry in the repository must focus on diabetic foot disease, be peer reviewed and have one author with an Australian affiliation. For people with diabetes, feet are often over-looked as the management of other aspects of diabetes takes higher priority. With over 50,000 Australians living with diabetic foot disease every day, Diabetic Foot Australia has developed the handy Daily Foot Checklist for people with diabetes to incorporate into their daily lives. Would you recognise your feet in a lineup? 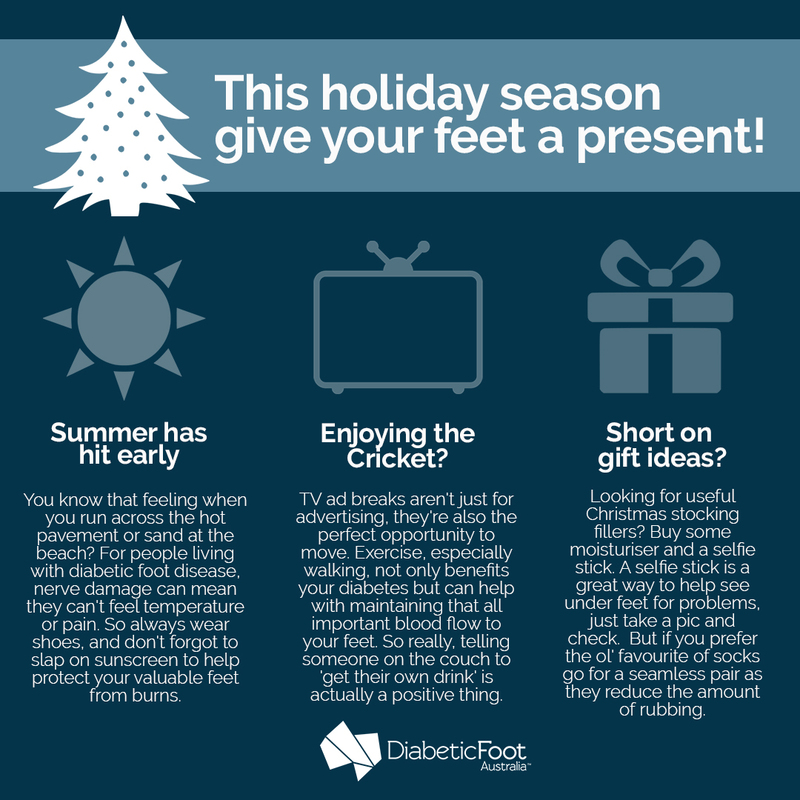 Have an upcoming event or activity with a focus on diabetic foot disease? We've developed a community noticeboard where you can stay-up-date with diabetic foot disease focused events and activities. Are there differences in what different diabetic foot guidelines recommend? Are we in a new wound dressing era for DFUs? Is intravenous better than oral antibiotics for treating osteomyelitis? How accurate are non-invasive peripheral arterial disease tests in people with diabetic foot ulcers? How do Infectious Diseases Consultants manage diabetic foot infection? Does revascularization of patients with claudication prevent amputation? Does high plantar tissue stress delay ulcer healing? What predicts diabetic peripheral neuropathy? Nearly half of Aussies that are at risk of foot ulcers have been found to wear inadequate outdoor footwear to prevent foot ulcers. A new systematic review has found multiple studies have implemented indigenous diabetic foot health programs, but very few have evaluated their clinical outcomes. Prof Viv Chuter’s busy team reviewed 13 studies: 5 implementing podiatry services and 8 education programs. Only one reported clinical outcomes, finding high patient adherence to podiatry consults. Most studies used materials from Jason Warnock’s well-respected Indigenous Diabetic Foot Program. They recommend urgent studies are needed to evaluate the clinical outcomes of indigenous diabetic foot health programs. The good news is they identify at least 2 new studies doing just that coming soon! This is it! DFA Conference Early Bird/Bunny is closing for good this Sunday. Awesome location - check. Fantastic speakers - check. Interactive program - check. Relaxed social events - check it all out below. A new study just published in the journal Diabetes/Metabolism Research and Reviews has found that there are many differences between recommendations made in national diabetic foot disease guidelines (including Australia’s) and those made in the peak International Working Group on the Diabetic Foot (IWGDF) guidelines. DFA2019 Conference Early Bird rates have just been extended for 2 weeks only! So get in before midnight 14APR to save! 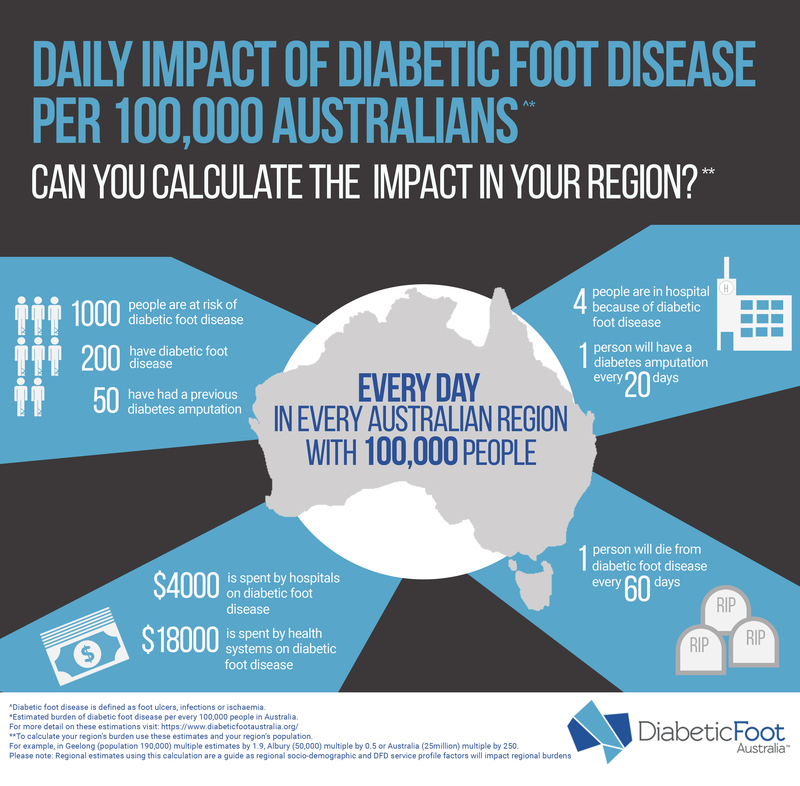 Here at DFA, we develop a range of documentation and infographics focused on the impact of diabetic foot disease in Australia. While we encourage the sharing of DFA materials across the web and social media, please do not upload any DFA materials directly to another website, or alter these items, without DFA permission. By instead directing all downloads to our webpages, we are able to ensure the latest versions are available at all times. View our latest infographics below. For World Diabetes Day 2018 - Helping a stubborn family member is easier than you think! For National Diabetes Week 2018 - would you recognise your feet in a line up? Overview of information and how family can help. 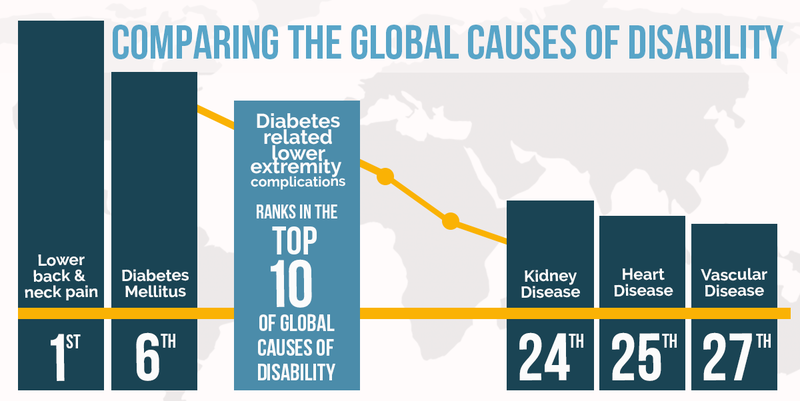 Where does diabetic foot disease rank in the global causes of disability? Introducing the Australian Diabetes-Related Foot Disease Strategy 2018-2022. 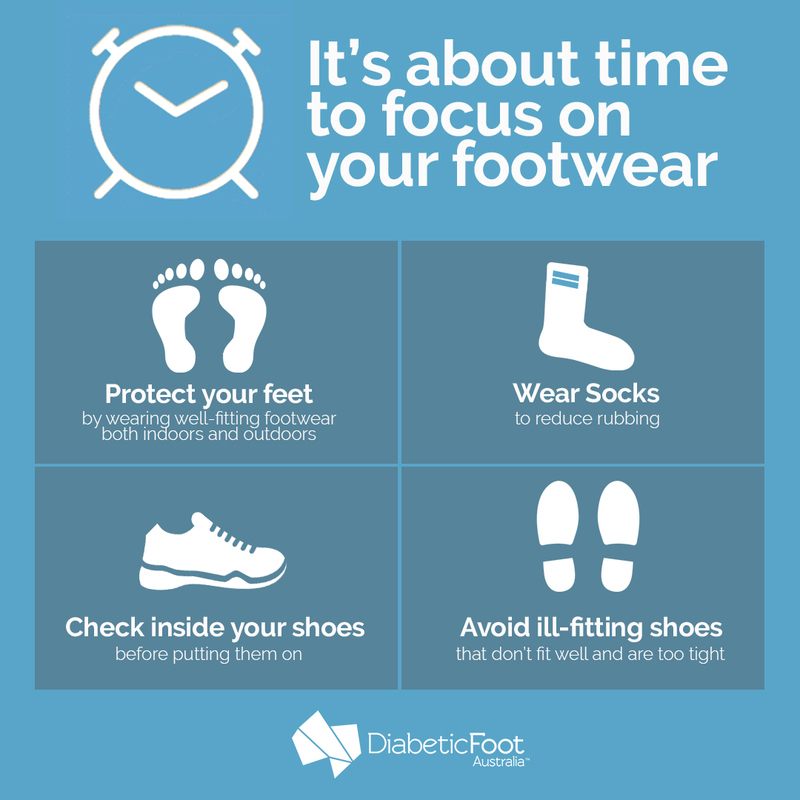 For National Diabetes Week 2018 - it's time to focus on the importance of footwear. The new 2018 Australia guideline on footwear for people with diabetes highlighting the 10 key points. Highlighting the impact of diabetic foot disease on any given day in Australia in 2017. Can you calculate the diabetic foot disease burden in your region? 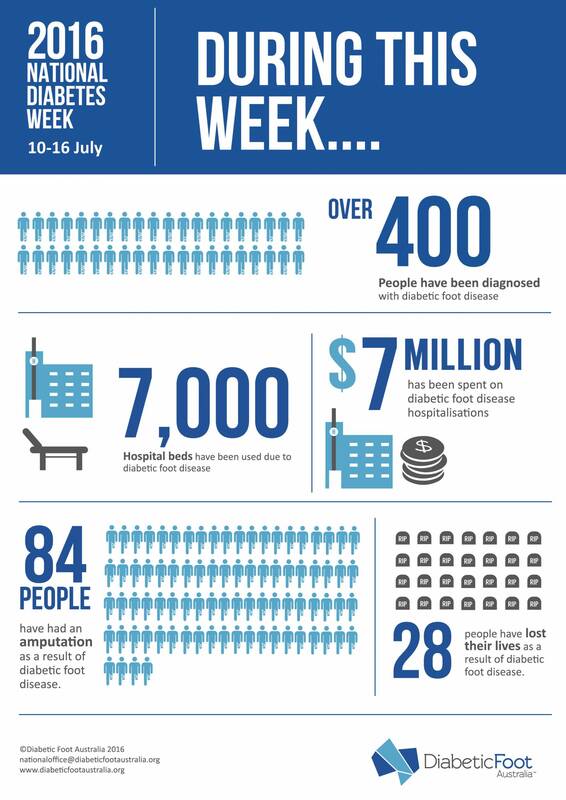 Released in 2016, this popular infographic highlights statistics if all Australians with diabetic foot disease lived in Canberra. 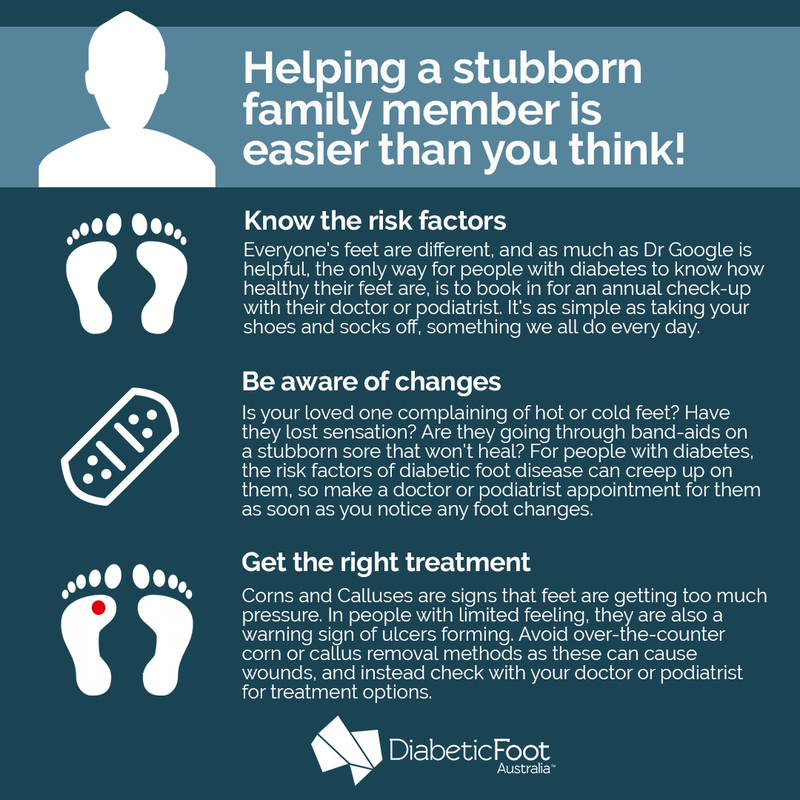 © 2019 Diabetic Foot Australia.